FiveStars is a loyalty system that enables businesses to attract and retain customers and convert potential clients by providing them with rewards for their brand loyalty. Trusted by more than 10,000 local businesses, FiveStars has the tools to help businesses create powerful incentives that drive customer visits and increase their spending by up to 10% at every instance. With FiveStars, businesses are able to retrieve critical customer data that helps them identify their preferences, spending habits, and other indicators. Valuable information allows users to create the most effective, customized rewards programs that not only attracts their existing customers, but encourages them to spend more, resulting to higher income and much improved ROI. To drive your business endeavor to success, your company needs to have a constantly expanding, growing customer base. The sad part is that 50-60% of customers will not likely return for a visit after their first purchase. So how do you foster customer relationships and turn them into meaningful, rewarding partnerships when more than half of your first-time customers aren’t exactly eager for a repeat purchase? 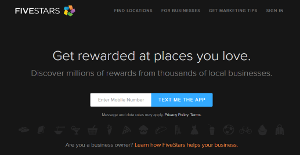 FiveStars Loyalty Program solves that problem and more. This customer loyalty app guarantees to help you attract and retain up to 50% of your customers after their first visit with rewards programs that actually works. Whether you just want a simple loyalty scheme or a complicated rewards program, FiveStars helps you craft something that is customized based on accurate and recent customer data. Effective rewards programs not only helps you retain old customers and keep them coming back for repeat purchases, it also helps boost your marketing efforts as your customers relay their experiences to their circle of friends and loved ones, effectively spreading good word about your loyalty programs to their other circles, and the process goes on. The software is easy to use and doesn’t demand an extensive training to help your people get familiar with the system. For customers, joining rewards programs created using FiveStars’ technology are in for a very fast, seamless, and rewarding experience. Programs are shown the rewards program via a sleek tablet, which helps get the attention of your customers. They can easily sign up for programs that appeal to them without impeding your other processes. Easy registration coupled with fast and intuitive technology results in faster and accurate gathering of customer data, which drives the creation of rewards programs that appeal, attract, and turn visitors into loyal customers. What Problems Will FiveStars Solve? Every organization has different wants and requires an application that can be personalized for their size, type of workers and buyers, and the specific industry they are in. For these reasons, no software can provide perfect functionality off-the-shelf. When you try to find a software app, first be sure what you require it for. Read some FiveStars reviews and ask yourself do you desire basic functionality or do you want complex tools? Are there any industry-specific functionalities that you are seeking? Find the answers to these queries to assist your search. There are plenty of factors that you need to consider and these include your finances, specific business requirements, your company size, integration requirements etc. Take your time, check out a few free trials, and finally select the platform that presents all that you want to improve your firm efficiency and productivity. How Much Does FiveStars Cost? FiveStars is a quote-priced system, meaning that each client receives an individual SMB or enterprise pricing package tailored to his needs. Contact the company for more details, and ask for your quote. We realize that when you make a decision to buy Demand Generation Software it’s important not only to see how experts evaluate it in their reviews, but also to find out if the real people and companies that buy it are actually satisfied with the product. That’s why we’ve created our behavior-based Customer Satisfaction Algorithm™ that gathers customer reviews, comments and FiveStars reviews across a wide range of social media sites. The data is then presented in an easy to digest form showing how many people had positive and negative experience with FiveStars. With that information at hand you should be equipped to make an informed buying decision that you won’t regret. What are FiveStars pricing details? What integrations are available for FiveStars? If you need more information about FiveStars or you simply have a question let us know what you need and we’ll forward your request directly to the vendor.